The La Pavoni Stradavari sixteen cup in chrome features a 38 oz. boiler, and internal thermostat. This lever model includes nickel plated non-corrosive brass boilers, recessed power switch, dual frothing cappuccino systems, and a reset safety fuse. Includes a 1-year warranty. 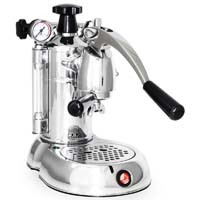 Comments: I got this to replace a previous La Pavoni machine that I had for 25 years. There is a learning curve with La Pavoni's but once you get the knack you can make consistently excellent espresso. This model is more heat-stable than my old one. Also, the milk steaming rod is easily removable for cleaning.